Hermann Ritter von Speck was born on August 8, 1888 in München. During the First World War he fought in various battles on the Western Front. “…wegen seiner im Gefecht bei Gellenoncourt bewiesenen Tapferkeit bei einem mit großem Schneid augeführten Erkundungsritt und bei der freiwillig übernommenen Führung eines Artilleriezuges in die Feuerlinie trotz besonders schwieriger Terrainverhältnisse”. 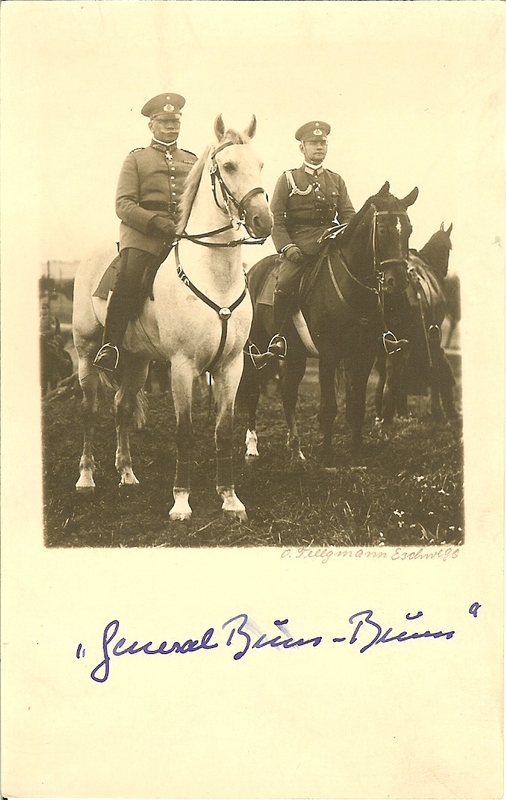 Figure 1: Photograph of Reichswehr Colonel-General and Chief of Army Command August Wilhelm Heye and Major Hermann Ritter von Speck taken in 1929 in Buenos Aires. Major Hermann Ritter von Speck is wearing an adjutant’s aiguillette (Adjutant Achselschnur). The photograph is by photographer Oscar Tellgmann (*9.20.1857, †1936). Image from the author’s archive. 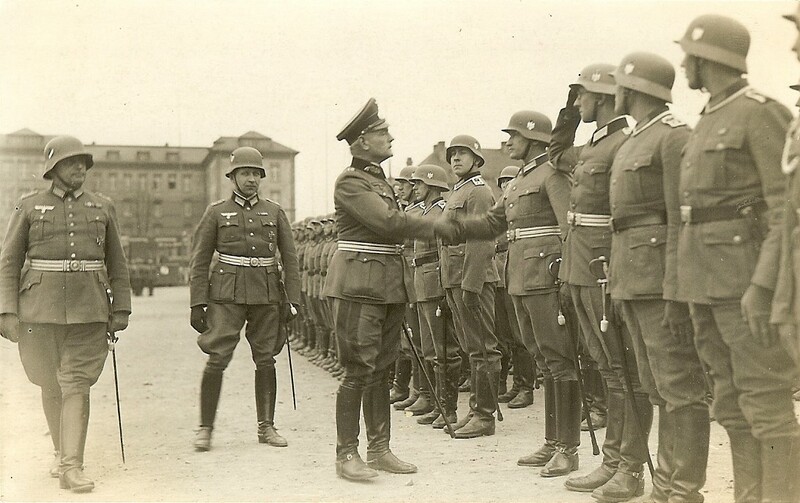 During the late 1920’s Reichswehr Colonel-General and Chief of Army Command (Generaloberst u. Chef der Heeresleitung) August Wilhelm Heye was part of the German delegation which visited Chile and Argentina as military advisors to the governments of those nations. Reichswehr Lieutenant Ritter von Speck (promoted to Major on November 1, 1927) was also part of the delegation which visited Chile and Argentina. It was undoubtedly because of his involvement as an advisor during this time that he was awarded the Chilean Order of Merit. The photograph in Figure 1 shows Major Hermann Ritter von Speck wearing what is believed to be an adjutant’s aiguillette (Adjutant Achselschnur). It would therefore stand to reason that Hermann Ritter von Speck was Colonel-General and Chief of Army Command August Wilhelm Heye’s adjutant at the time. 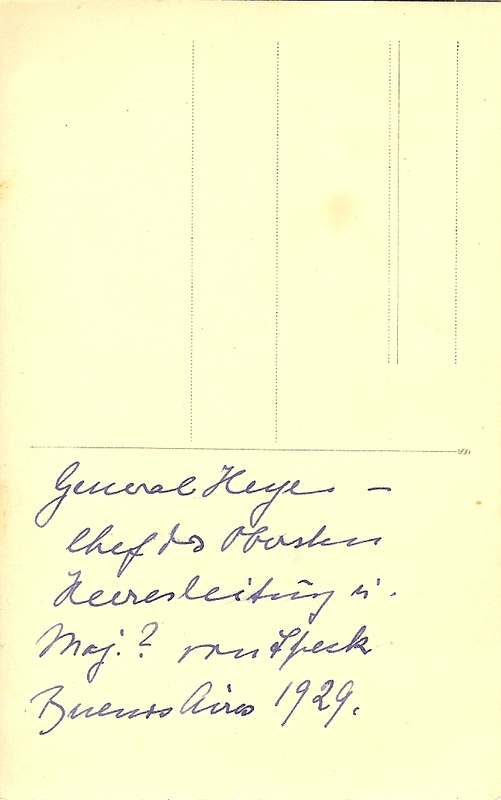 Figure 2: Reverse of the photograph shown in Figure 1 on which is written: ” General Heye – Chef der Oberste Heeresleitung u. Maj. ? von Speck Buenos Aires 1929.” (General Heye – Chief of the Supreme Army Command and Major ? von Speck Buenos Aires 1929.) Image from the author’s archive. 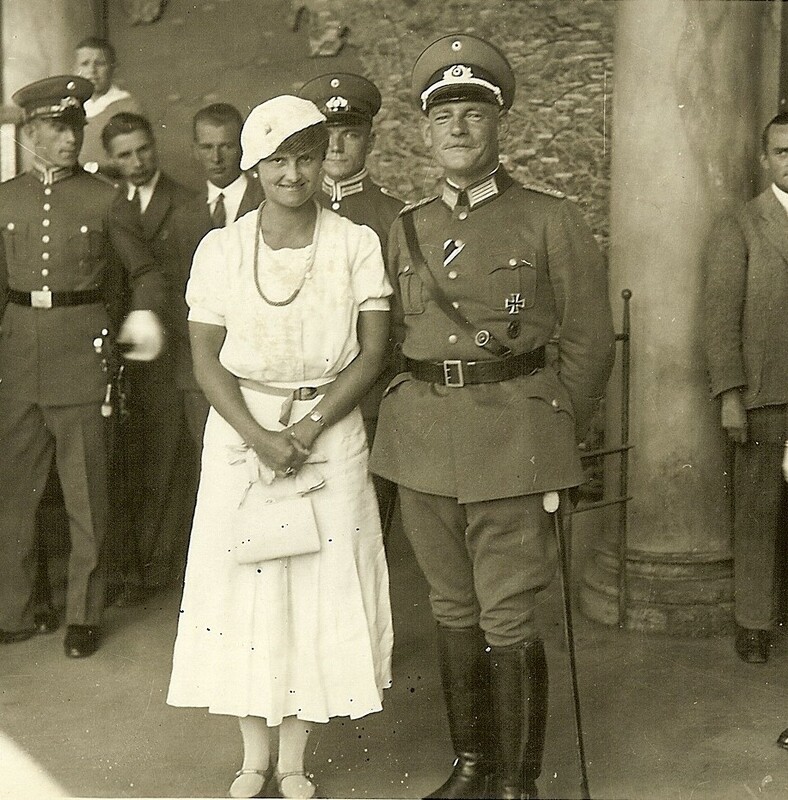 Figure 3: Undated photograph (<1933) of Hermann Ritter von Speck with Melitta, née Rogetzki his wife. Image from the author’s archive. 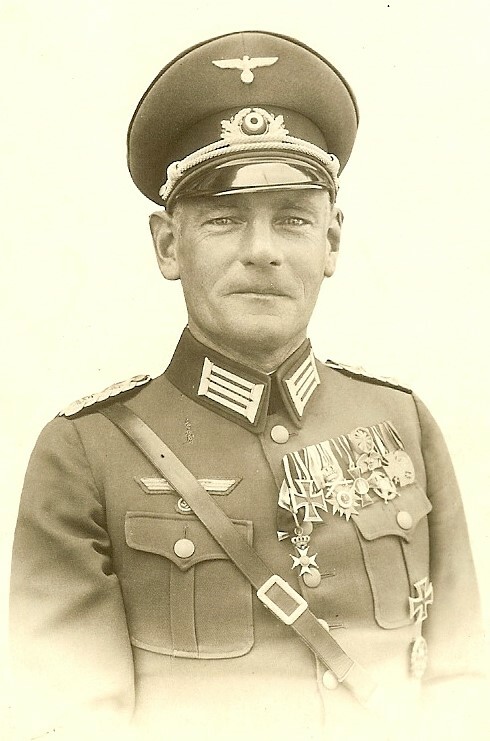 Figure 4: Undated photograph (>1933) of Hermann Ritter von Speck wearing his large medal bar. In the forth position from the left is a Chilean Order of Merit. Image from the author’s archive. On February 1, 1932 Hermann Ritter von Speck was promoted to Lieutenant-Colonel (Oberstleutnant). 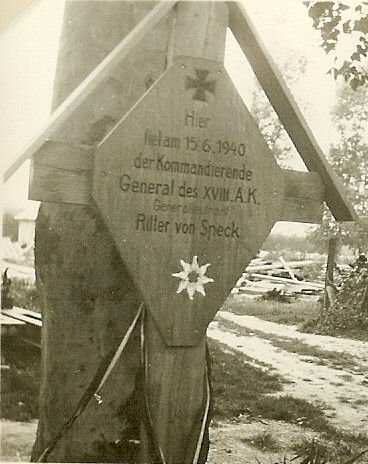 On August 1, 1937 Hermann Ritter von Speck was promoted to Major-General (Generalmajor). 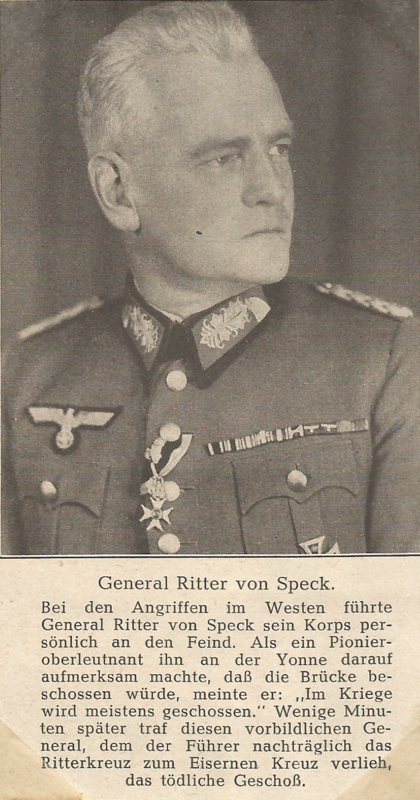 And, on June 1, 1939 Hermann Ritter von Speck was promoted to Lieutenant-General (Generalleutnant). Figure 5: Undated photograph (>1937) of Hermann Ritter von Speck wearing a General’s uniform. Image from the author’s archive. This photo was taken by a photographer from Mannheim and was therefore probably taken while Hermann Ritter von Speck was the Commander of the 33rd Infantry Division headquartered at Darmstadt. Prussia, 1914 Iron Cross, 2nd Class. Bavaria, Military Max Joseph Order Knight’s Cross. Bavaria, Military Merit Order (Class unknown). Bavaria, Military Merit Order 4th Class with Swords and Crown [Awarded on October 24, 1918 to Captain (Hauptmann) Ritter von Speck 3rd Field Artillery Regiment]. Honor Cross of the World War for Combatants with Swords (aka: “Hindenburg Cross”). 3rd Reich, Long Service Award for 25 Years of Service. 3rd Reich, Long Service Award for 12 Years of Service. Chile, Order of Merit (Class unknown). Bavaria, 1905 Jubilee Medal for the Bavarian Army (This ribbon could signify another award however). Figure 6: Undated photograph (>1937) of Hermann Ritter von Speck reviewing troops. Image from the author’s archive. Major-General (Later Lieutenant-General) Hermann Ritter von Speck was the Commander of the 33rd Infantry Division (33. Infanterie-Division) from March 1, 1938 until April 29, 1940. 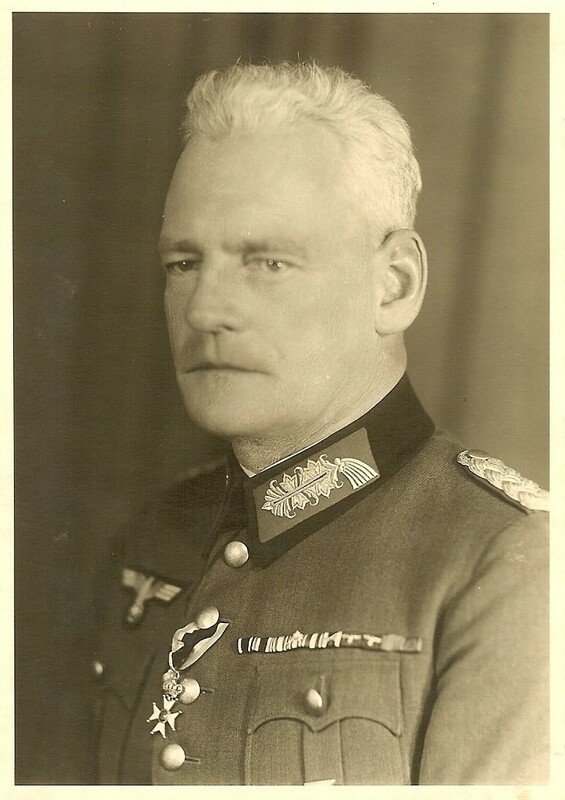 Lieutenant-General Hermann Ritter von Speck was the Commander of the XVIII Army Corps (XVIII Armeekorps) from June 5, 1940 until his death on June 15, 1940 at Pont sur Yonne. 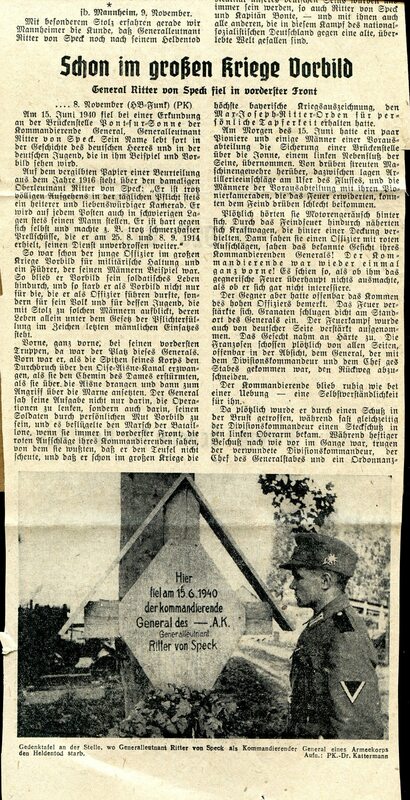 ‘Ein Kriegsberichter schreibt am 6. 7. 1940: “Am 15. 6. fiel bei einer Erkundung der Brückenstelle bei Pont sur Yonne der stellv. Kd. Gen., Genlt. Ritter v. Speck. Am Vormittag hatte der Gen. einen Frontflug m. d. Fieseler-Storch unternommen, um die Brückenverhältnisse über die Yonne zu erkunden u. das Vorgehen seiner Truppen zu beobachten. Auf Grund dieser Lufterkundung begab er sich m. seinem Gen.St.Chef nachmittags im Kraftwagen an die Brückenstelle, um sich dort über das Ansetzen einer Vorausabt. zu unterrichten u. auf die Brückenstelle selbst für einen etwaigen Übergang Einblick zu gewinnen. Gen. v. Speck traf in der Nähe der Brücke einen seiner Div.Kdre. u. begab sich mit diesem u. seinem Chef, ungeachtet des dort einschlagenden Inf. Feuers an den Fluß. Einige Pi. Unter Führung eines Obstlt., sowie Angehörige der Vorausabt. hatten die Sicherung an der Brücke übernommen. 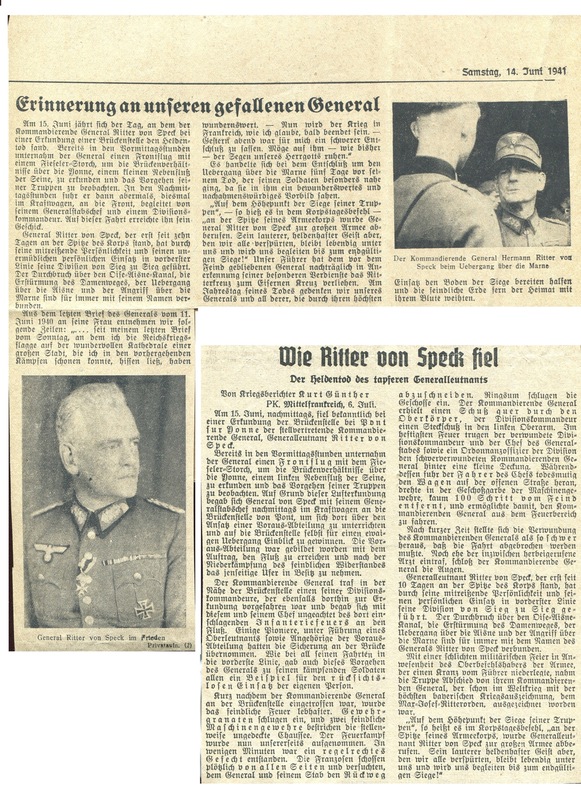 ‘A war reporter wrote on July 6, 1940: “On June 15 the Acting Commanding General, Lieutenant-General Ritter von Speck fell during a reconnaissance of the bridge position at Pont sur Yonne. In the morning the General had undertaken a front flight with the Fieseler Strorch to explore the condition of the bridges over the Yonne and to observe the action of his troops. On the basis of this aerial reconnaissance he came with his General Staff Chief in the afternoon in motor vehicles to the bridge position, where they placed an advance detachment to advise and to gain insight on the bridge position itself to obtain a possible crossing. General von Speck met one of his Division Commanders and came with him and his Chief near the bridge, despite the impacting infantry fire on the river. Some engineers under leadership of a Lieutenant-Colonel, as well as members of the advanced detachment had taken over securing the bridge. A temporary field memorial (cenotaph) was erected for Lieutenant-General Ritter von Speck at Pont sur Yonne at the location where he fell. The inscription on the field memorial read: “Hier/ fiel am 15.6.1940/ die Kommandierende/ General des XVIII.A.K./ Generalleutnant/ Ritter von Speck” (“Here/ fell on June 15, 1940/ the Commanding/ General of the 18th Army Corps/ Lieutenant-General/ Ritter von Speck”). 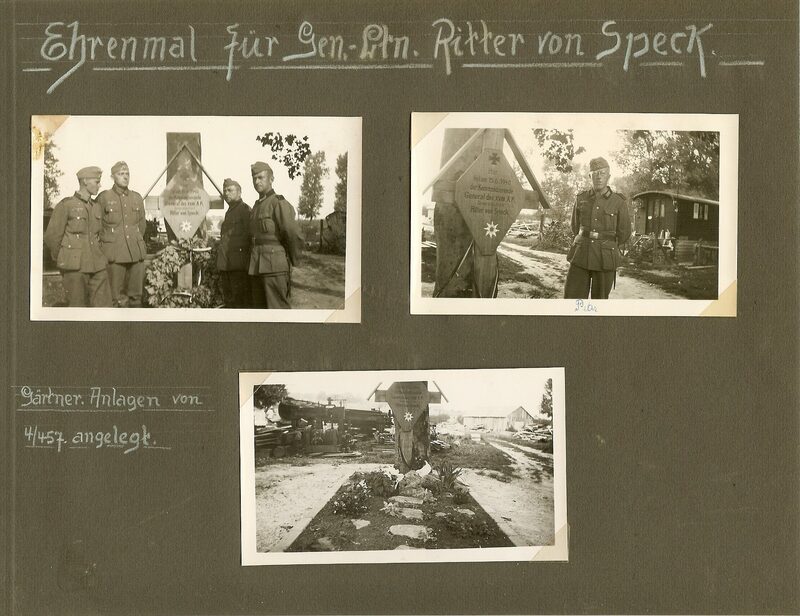 Figure 7: Photographs taken in 1940 at Pont sur Yonne showing the field memorial for Generalleutnant Hermann Ritter von Speck. Image from the author’s archive. Figure 8: Detail of a photograph of the field memorial for Generalleutnant Hermann Ritter von Speck at Pont sur Yonne. Image from the author’s archive. 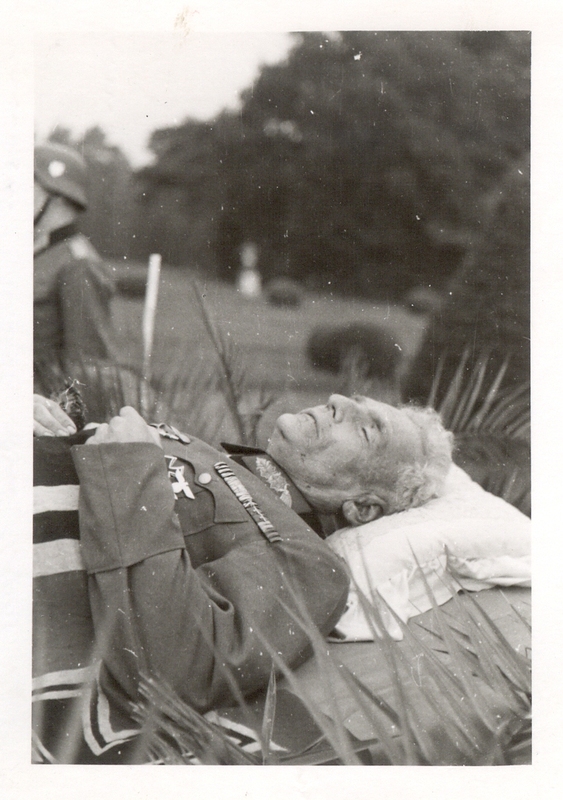 Figure 9: Photograph of the body of Generalleutnant Hermann Ritter von Speck lying in repose in 1940. On his uniform is his field ribbon bar along with other awards. Image from the author’s archive. In the photo above, on the uniform of Hermann Ritter von Speck can be seen a field ribbon bar with a hard backing with ribbons signifying the awards noted above. Note that the field ribbon bar in the photo below is a match to the type shown in the photo above. It is therefore possible that the field ribbon bar shown below once belonged to Hermann Ritter von Speck. Figure 10: A field ribbon bar that may have once belonged to Generalleutnant Hermann Ritter von Speck as the awards represented are identical to those awarded to him. Image from the author’s archive. 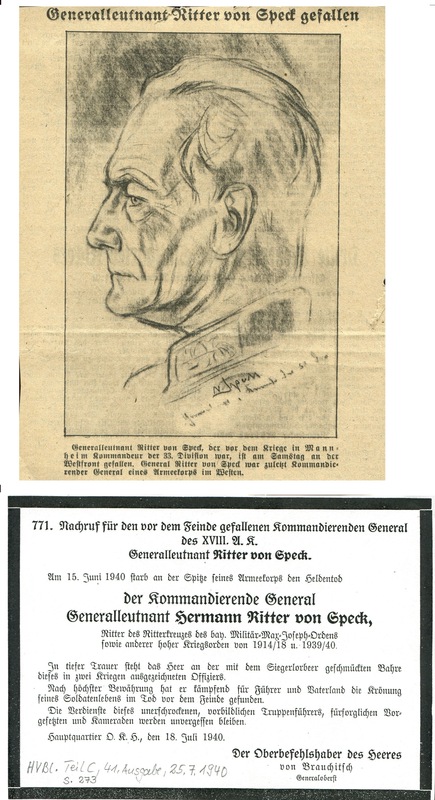 Figure 11: Memorial publication regarding the death of Generalleutnant Hermann Ritter von Speck circa 1940. Image from the author’s archive. Kramer, Rudolf von, Waldenfels, Otto von, and Pechmann, Dr. Günther Freiherr von. Virtuti Pro Patria, Der königlich bayerische Militär-Max-Joseph-Orden, Kriegstaten und Ehrenbuch 1914-1918. Selbstverlag des königlich bayerischen Militär-Max-Joseph-Ordens, München, 1966. Roth, Erhard. Statistische Ausarbeitungen zur Phaleristik Deutschlands Band VI, Verleihungen von militärischen Orden und Ehrenzeichen des Königreichs Bayern im Ersten Weltkrieg 1914-1918. PHV Phaleristischer Verlag Michael Autengruber, Offenbach am Main, 1997. 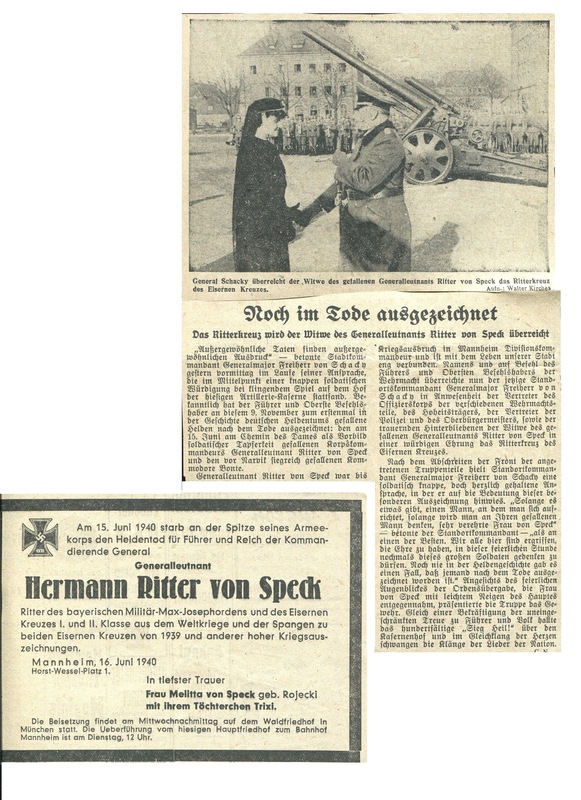 Hello Lorin, congratulations on the very successful article about Ritter von Speck. In addition to this a few pictures. Thank you for your comment regarding the article. I appreciate your addition of this fantastic information regarding Ritter von Speck. 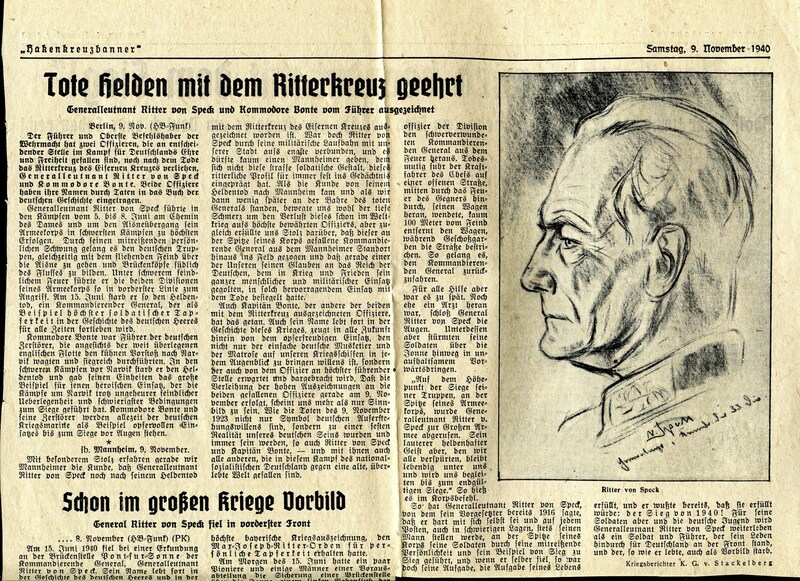 I found your article about Ritter von Speck very informative. For some years now I have been trying to pull together information on the 33. Infanterie Division, which he commanded for 2 years between 1938 and 1940. Amongst the information you have on Ritter von speck, is there anything on his activities as the commander of this Division ? Or could you direct me towards any such information of which you are aware. Thank you for your inquiry. Unfortunately, I have not been able to find a source regarding the specific history of the 33rd Infantry Division from 1938 through 1940. There does exist the book: “Division Sintzenich: Erlebnisberichte aus dem Feldzug in Frankreich 1940, by H. Müller”. This book in commonly available for a nominal fee and may contain general information regarding the 33rd Infantry Division from May of 1940. First of all thank you for replying to my enquiry, and secondly my apologies for this extremely tardy response. I do have a copy of “Division Sintzenich” and it was the acquisition of this book which initially engendered my interest in the 33rd ID. As a wartime publication it is of course restricted in the details that it provides (eg on regimental numbers) but despite this it does give a good idea of the Division’s role in the 1940 French Campaign. Over the years I have been able to pick up other items on the history of the 33rd ID and its constituent units, such that I am considering trying to draw together a potted history, covering the period from 1936 when it was formed, until 1940 when it was used as the basis for the 15th Panzer Division. Thank you for your comments regarding your research regarding the 33rd ID. If I can be of any assistance regarding your possible pending publication, please let me know. Also, please advise when your research is published as I look forward to reading it.